Might Manny Pacquiao – Floyd Mayweather Truly Be In The Works? Although most would agree that all things Mayweather-Pacquiao should be taken with a grain of salt at this point there’s no doubt that the eagerness factor is starting to build again, not only among fight fans, but around the sports world in general. People want to see this fight. Period. Now, after PacMan has defeated Chris Algieri in an almost comically dominant fashion, the chatter will once again reach a near fever pitch. Will this time be any different? Who knows? There is one thing worth noting, however. CBS honcho Les Moonves is apparently interested in seeing Mayweather-Pacquiao come to fruition. It’s worth keeping in mind that CBS controls Showtime, the network Mayweather still has an extremely lucrative contract with. If that doesn’t count for something, it’s hard to imagine what does. “He’s going to fight me?” Pacquiao laughed when Max Kellerman asked about Mayweather after Saturday’s fight. “Yes!” Pacquiao was, of course, referring to a pretty funny ad he’s recently done for Foot Locker. Still, in spite of his easy going nature, it’s clear he’d love to fight the guy they call Money. “I’m ready to fight. 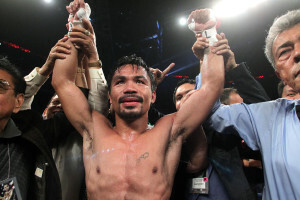 I’m ready to fight next year for him,” Pacquiao said. In the end, though, both sides will have to decide if they want the bout or not. Many, many fans and analysts feel Floyd simply doesn’t want to get into the ring with the Filipino legend. There are those, however, who aren’t so quick to write Floyd off. “He does want to do things on his terms, on his turf, when he feels like it,” Roy Jones Jr. said of Mayweather on Saturday evening after the Pacquiao-Algieri blowout. Here’s the truth – Mayweather needs the fight more than Pacquiao does. Believe it. For whatever reason, people now blame Mayweather for the fact the bout hasn’t happened yet. That’s going to stay with Mayweather – and his legacy – as long a Pacquiao-free undefeated record will. Fair or not, Pacquiao is viewed as the good guy in all of this. That’s unlikely to change. What’s more, PacMan comes across as a guy who doesn’t need a great legacy (which he’ll undoubtedly have anyway) in order to feel okay with himself. Can the same be said of Mayweather? Probably not. The reality is that Mayweather will be more respected for losing to Pacquiao than he will if he never fights the guy at all. History will be kinder to him, as well. Muhammad Ali. Mike Tyson. Joe Louis. Ray Robinson. Countless greats have lost. Yet they’re still considered great. In the end, though, only the players involved know what’s actually going on. For all anyone knows Floyd really wants the fight. Perhaps he’s really wanted it for years. Who’s to say? As far as perception goes, however, Mayweather is seen as avoiding a feared opponent. And perceptions matter – like it or not. It’s time – finally – for this match to happen.